HomeBlogSpiritualityDo You Go To an Acts 2 Church? I recently visited a church that upheld Acts 2:42-47 as their model for church. Shocked, I checked the passage to make sure I remembered it correctly. Their Four Keys: The church in Acts 2 has four priorities: studying good teaching, hanging out, sharing meals, and praying (verse 42). That’s a great start, but many churches today don’t even do that, not really. Their Miracles: Amazing supernatural things occur. People are amazed (verse 43). Today, most churches don’t encounter anything supernatural; they forgot how or never learned. And for those that do walk in the power of the Holy Spirit, their focus is on the experience, not on people’s reaction. Their emphasis is backwards. The purpose of “signs and wonders” isn’t to gratify themselves; it’s to show God’s power, pointing outsiders to him, not delighting insiders. Their Finances: The kicker is that they pool their resources; they even sell their possessions to give to everyone in need. The church takes care of their own (verses 44 and 45). Too many churches today do not even care for the needs of their members; they expect government or some other organization to. And I’ve never encountered a church that shares all their material possessions. That’s just un-American! Their Pattern: They continue to hang out—every day—and share food. They are delighted (verse 46). I don’t know of any church family that meets every day, but the Acts 2 church did. Their Results: Because of all this, others esteem them and they grow (verse 47). Too often today’s churches don’t have the respect of society but quite the opposite. 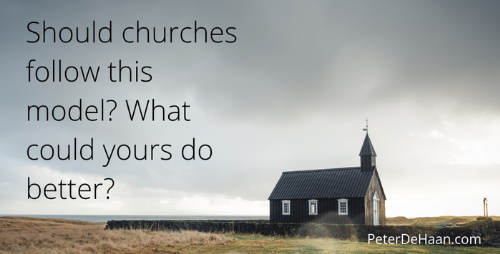 Too many churches aren’t growing; they’re not even maintaining; they’re dying. However, none of the things the church did in Acts 2 are commands for us to follow. The passage is descriptive; it shows what the church did and the outcome they enjoyed. It may be a viable model for us to follow. Unfortunately, many churches today don’t even practice these four key actions; supernatural results are rare; and sharing everything is virtually nonexistent. Is it any wonder why churches aren’t respected by society or growing? Perhaps they’re doing church wrong and not more closely following the Acts 2 model. Should churches follow this model? What could yours do better?